Yellow jackets are wicked little critters with yellow and black bodies and long wings that resemble honey bees. They are not as plump as their brethren however, and their bodies are segmented. Their hind legs are not extended for the collection of pollen, as is the case with the honeybee. This small genus of social wasps can be found throughout the Northern Hemisphere, and you may start seeing them appear throughout Pittsburgh and Western Pennsylvania as early as May or June, with July, August and September being their highest months of activity. Come late Fall the workers and queens die off and their nests are abandoned. When yellow jackets build nests in homes, yards, or commercial freestanding structures, their presence can be hazardous to children and families. They are very aggressive if their nest is threatened, and they have the capacity to sting many times in rapid succession. Reactions vary, and can range from quick healing to hospitalization and even death in severe cases to humans who suffer from allergies. Removal of these insects is best left to the expertise of pest control and pest management professionals, such as our teams at Pestco Professional Services. Read on to learn more about this stinging insect, submit a written inquiry or contact our team today for ongoing preventative or emergency pest control services (412) 252-5200. Explore the other spring time pests to guard against! Yellow jackets are known to nest underground, inside the walls of both homes and commercial spaces, in trees or dried out tree stumps. Although they can be found all over the world, there are about 16 separate species that thrive in the United States. Highly sociable, only the queen survives the cold winter and starts a new colony in the spring. In some species, the queen will build the new nest either under or above ground. They tend to nest in secure places such as hollow logs, stumps, barks of trees, rodent burrows. These structures are built by using fibers scraped from wood that are mixed with saliva (chewed cellulose). By nature, yellow jackets are scavengers. They hover around outdoor eateries, theme parks, receptions, picnics and barbecues, seeking soda cans and sugary treats that humans have discarded at sporting stadiums. They can be found near pet food bowls that are left outside, garbage cans or any place they can find rotting or overripe fruit. They also congregate near bakeries and candy factories, as their bodies’ incessant demand for sugar attracts them to these foods. During the summer months, their numbers increase drastically and their diet becomes one requiring even more sugars. At this time of year, workers pursue these additional sugar sources because the next generation of queens cannot survive without it. The diet of the adult yellow jacket consists of both sugars and carbohydrates, such as fruits, flower nectar, and tree sap. Larvae feed on proteins derived from insects, meats, and fish, which are collected by the adults that chew and condition them before feeding them to the larvae. In turn, the larvae secrete a sugary material that is eaten by the adults. This exchange process between organisms is known as trophallaxis. As is the case with all living things, the yellow jacket has its place in Mother Nature’s food chain. During their nest building in early spring and summer, the diet of the yellow jacket is primarily carnivorous. They feed their young liquefied garden pests such as spiders, house fly and blow fly larvae and caterpillars. As such, they are beneficial to agricultural crops and ornamental plants. The food demands of growing colonies are so great that it has been estimated that yellow jackets remove more than 2 pounds of insects per season from a 2,000-square-foot garden. Both residences and commercial spaces must make their surroundings unattractive to yellow jackets by removing desirable foods and nesting materials. Since these insects eat other insects, trash, and debris, storing trash in covered bins as far away from a residence or commercial building as possible and keeping a backyard free of debris can help create a clime that is unfavorable. Keeping walls properly sealed and a careful eye on the eaves and borders along the yard can make it easier to spot nests before they become too large to deal with. Damages to homes and industry occur because yellow jackets construct their nests from materials they source from surrounding structures. These nests can contain thousands of insects, and are often very large and quite heavy. This process, over time, can weaken and wear away building walls and ceilings, causing very perilous conditions and potential structural collapse. While it may be true that some pests can be eliminated with do-it-yourself remedies, when dealing with yellow jackets, as well as any other stinging insects, this is not a recommended course of action. Our technicians should always be contacted to eliminate a yellow jacket infestation, as over the counter sprays and other such products are not only ineffective, they can also have dangerous repercussions. We have been a leading company within the pest control and pest management industry for well over seven decades, and our well-trained, licensed technicians provide superior services to all types of residences and commercial enterprises throughout Pittsburgh and its environs, and for businesses throughout every Western Pennsylvania county, Eastern Ohio and the West Virginia panhandle. Officially established in 1948 by a Lithuanian immigrant named Milton Zlotnik, it began with the name, Pittsburgh Exterminating Service and Termite Control (which later became Pestco Professional Services). Born as a mom-and-pop, home-based business, the company began to expand as Zlotnik immersed himself in learning all he could about insects. He made the acquaintance of the leading entomologist of the day, Arnold Mallis, whose book, the Mallis Handbook of Pest Control, is considered by many to this day to be the absolute authority on urban entomology. We are a family owned and 5-star-reviewed business, and a leader in the pest control and pest management sector. Our stellar customer service reputation is unmatched anywhere within the industry. Heinz Field and PNC Park are among some of our high profile clients in the Pittsburgh area. We provide superior services and use products that far exceed industry standards. Our knowledgeable and highly trained technicians can provide quick answers to all questions concerning pest control and preventative pest management. Our solutions are steeped in decades of hands-on, extensive experience and we are based on the principles of prevention; inspection; exclusion; understanding insect behavior and the ability to identify signs of any type of infestation. Eliminate that yellow jacket problem with a company you can trust! Contact Pestco Professional Services today for help with our pest control and pest management services. (412) 252-5200. 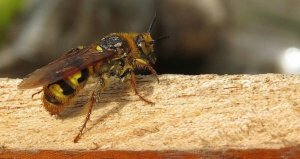 While yellow jackets are grouped in the general category of stinging insects, they have quite a few unique characteristics that set them apart from others of their kind. Here are a few little known facts about these nasty insects. Yellow Jackets Are Not Bees. Easily mistaken for bees because of their similar size and coloration, Yellow Jackets are wasps and differ from bees in several ways. They are more brightly colored and they have less hair than bees. They also have black and yellow stripes on their abdomens and a very narrow waist. The Yellow Jacket Consumes Protein in Its Larval Stage. Unlike other insects, the workers bring insects and other types of meat back to the nest as food for the larvae. In an odd twist of nature, their diet actually makes them integral to garden pest control. Their Mode Of Attack Is Unusual. Humans often unknowingly may disturb their nest, which results in vicious retaliation. Unlike other stinging insects, yellow jackets can sting multiple times, and their lance-like stingers have very tiny barbs, which sometimes get detached and lodge into the person’s skin, especially if the insect gets inside the clothing. Their Colonies Can Be Enormous. Each of their colonies can reach populations of between 1,500 and 15,000 individuals, which includes queens, drones (males), and workers. In some cases, huge colonies have been estimated to exceed 100,000 insects. Yellow Jackets Have Built-In Trouble Alarms. If attacked, every yellow jacket has a built-in alarm in the form of a released smell that alerts other nest mates to come to their aid. Yellow Jackets And Other Stinging Insects Cause Many Visits To Emergency Rooms. Insect bites from bees, hornets and wasps (including yellow jackets) send more than 500,000 people to emergency rooms each year. Some Insects Scare Off Predators By Mimicking Yellow Jackets In Color and Pattern. Valuable pollinators, such as flower flies (in the family Syrphidae) are incredibly convincing imitators of the fearsome yellow jacket. Their colorations of yellow, orange or red plus black or brown are very similar even though their colors are not as bold. There Is A City In Colorado Named Yellow Jacket. Located in Montezuma County and founded in 1914, this unincorporated community was named for the abundance of yellow jackets found near the original town site. The Georgia Tech Mascot Is A Yellow Jacket Named Buzz. Created in 1972 and restyled in 1979, Buzz is the official mascot of the Georgia Institute of Technology. Usually represented with yellow-and-black fur, white wings, a yellow head, and antennae, Buzz is never depicted with six legs, but rather with arms, legs, hands (in white gloves) and feet like a human. Does Your Pittsburgh Businesses Need Pest & Hygiene Control? In addition to our residential pest control services, we offer complete pest and commercial-grade restroom hygiene services to business establishments under our Complete Facility Care program. This three-pronged initiative is currently available to owners and managers of all types of commercial spaces within Pittsburgh and western Pennsylvania environs as well as parts of Ohio and West Virginia. Our expert technicians attend workshops regularly, which keeps them a few steps ahead of the pests they come face to face with on a daily basis, which includes infestations of yellow jackets near homes, and commercial structures. The Complete Facility Care program represents a vast array of professional services offered under one simple umbrella. While this offer provides the ultimate strategies for integrated pest control and pest management services, that is just one of three types of services available under one cost-effective blanket. The other two specialties concern superior washroom hygiene services provided Enviro-Master Pittsburgh and environmental odor control and air freshening solutions supplied by the ambient air-care leaders at Air-Scent International. All commercial enterprises should take advantage of this special limited offer. Harnessing these vital services for use into even the most mundane of business settings can enhance any company’s hard earned reputation and improve that all-important bottom line. Every business, no matter what industry, should strive to become the best it can be. This means becoming a pest-free establishment with clean, pleasant-smelling reception areas and restrooms for both visiting clients and employees.